Watch out! Here comes Dippy the Diplodocus Dinosaur in print form! 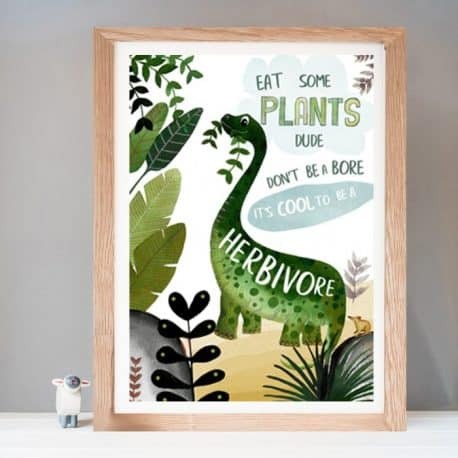 This stunning vegan dinosaur print is a must for little dinosaur lovers! In a beautiful colour palette this print is taken from an original painting created in watercolour and pen. It features Dippy, our adorable diplodocus and his mate Banjo the pig-footed bandicoot! The message is clear! Eat your greens and being a herbivore (vegan) is cool! 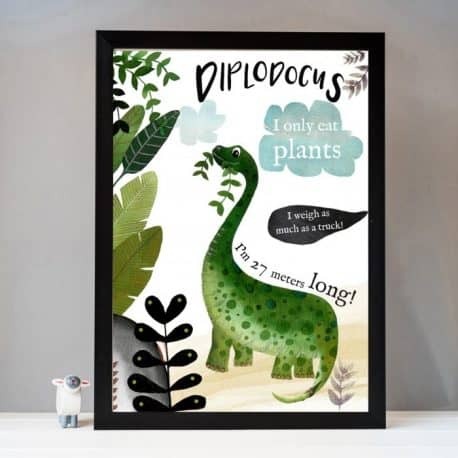 Our Dippy the vegan diplodocus dinosaur print will look amazing in the nursery or a child’s beroom and is great for boys and girls. 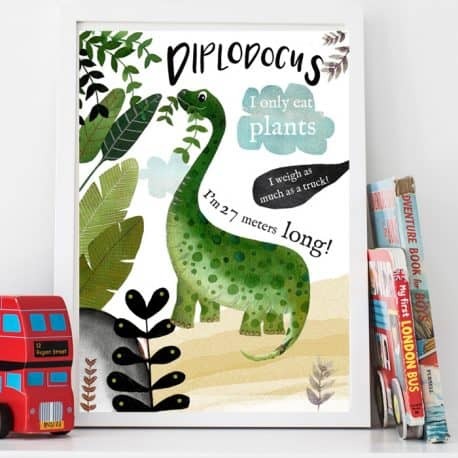 Our Dippy the diplodocus dinosaur print is here! 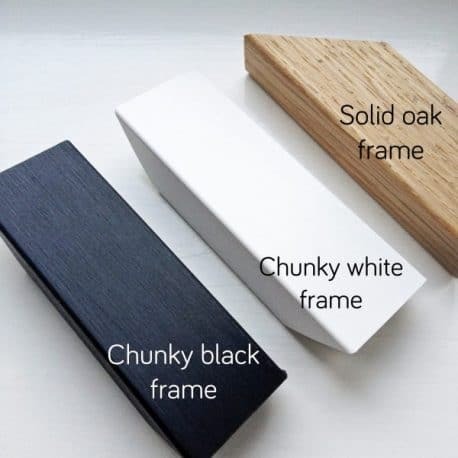 If you’re havng your print framed it will be mounted in a soft white mount and framed in an A3 chunky frame as shown in the photos. 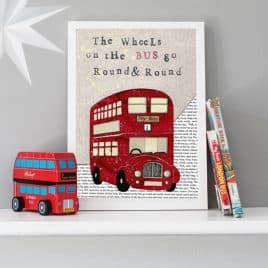 Printed onto beautiful, textured paper using pigment inks – your print will not fade. PLEASE NOTE: As all our frames are custom made to order, we cannot offer express delivery on framed prints. 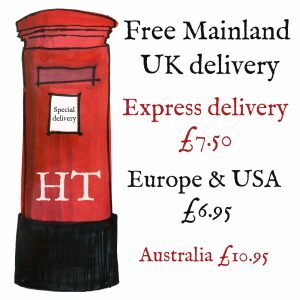 International delivery is not available for framed prints. 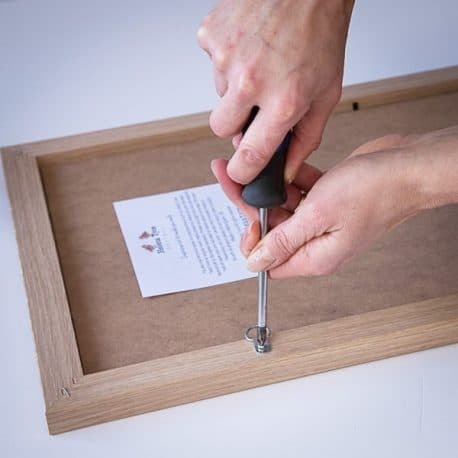 If you choose the framing option please allow a further 6-8 days for delivery. 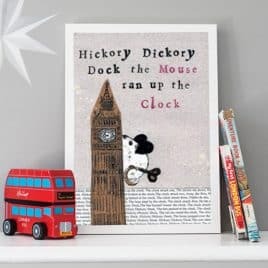 Size – H29cm x W21cm (A4). 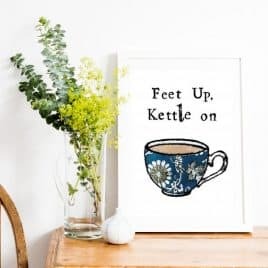 A gorgeous contemporary art print that says it all. 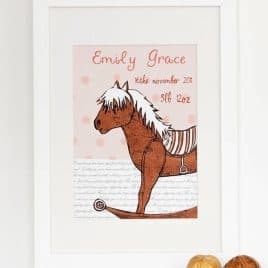 This nostalgic art print features an iconic wooden rocking horse and the nursery rhyme "Horsey, Horsey" in the background type. 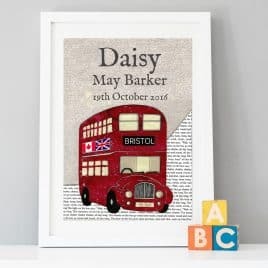 It can be personalised with baby's names, date of birth and weight.